Problems can occur when the lock is acquired, but not released. In this situation, you cannot configure zoning on that VSAN. If you are using the CLI, you see error messages when you attempt to enter the zoning configuration mode. 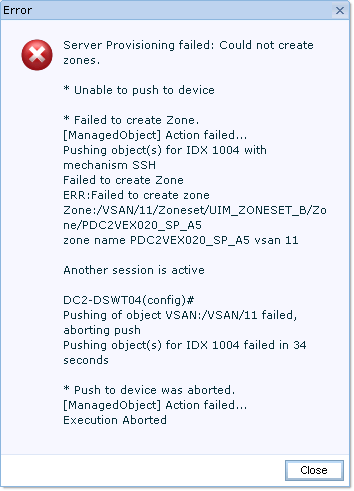 Use the ‘show zone status vsan‘ command to determine the lock holder. If the lock holder is on this switch, the command output shows the user. If the lock holder is on a remote switch, the command output shows the domain ID of the remote switch. Re-run the server provisioning in UIM/P.